Once again we are returning to Caer Beris Manor Hotel, and this venue is now our most popular venue. If you enjoy painting rivers, distant mountains, open moors, farms and other landscape gems, you will be over-loaded with subjects to paint. The grounds are extensive and bordered by the lovely River Irfon. As with all courses, David will be doing several demonstrations of watercolour painting and sketching and Jenny will be on hand if you wish to use pastel. 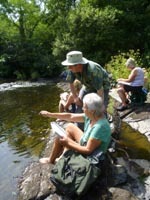 I’m interested in joining the David Bellamy watercolour course in October. Please send details. 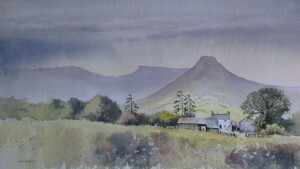 I’m interested in joining the watercolour course in October. Please send details. I live in the local area. Could I meet you jenny as u r a big inspiration to me and I love ur art n want to learn more.we have ur art at the health centre in Builth Wells and it always interests me. I’m away at the moment, but when I get back home I’d be happy to meet up. Please email me at jennykeal@gmail.com and then it will be in my in box to remind me!